While many cases of cardiac arrhythmia are harmless, others can lead to loss of heart function, breathing and consciousness, which can be dangerous and even fatal. 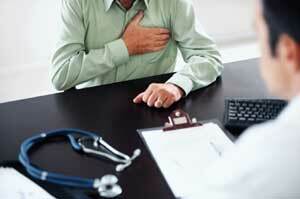 And arrhythmias – that is, irregular or abnormal heartbeats – are not uncommon. Atrial fibrillation, one of the most common arrhythmias, affects 2.7 million people in the US alone, according to the American Heart Association. Better understanding of how cardiac arrhythmias work will of course help to advance their prevention and treatment. Traditionally, surface electrodes have been used to this end; after all, arrhythmias are the result of a malfunction of the electrical impulses in the heart. But this approach is limited, suffering from low spatial resolution, low depth of field and far-field effects, for example. Optical mapping studies are providing important insights into the mechanistic origins of cardiac arrhythmias such as atrial fibrillation. Optical mapping with fluorescent probes – using voltage- and calcium-sensitive dyes, for example – offers a means to study the electrical activity of the heart with much higher spatial resolution than is possible with conventional electrode mapping, and furthermore contributes to better understanding of the coupling between excitation and contraction in the heart. Thus it can provide an important tool for exploring the underpinnings of arrhythmias. Optical mapping of the heart has grown in prominence in recent years, in large part thanks to advances in the technology. “Ten years ago, to do this type of imaging, you had to be an engineer building your own system,” said Igor Efimov, a researcher at Washington University in St. Louis who has worked to develop the technique since its early days. Today, cardiologists, physiologists and any number of other nonengineers can now also benefit from use of the approach. 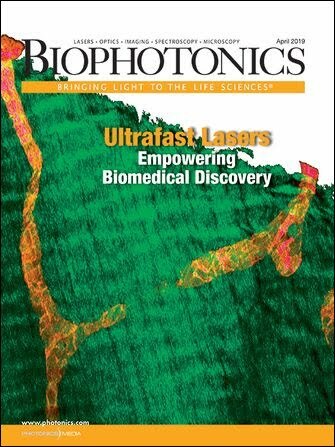 Still, challenges remain in optical mapping studies. One of the most significant is how to account for motion artifacts – namely, for the beating of the heart. Researchers have developed a variety of means to do so. Perhaps the most common of these is using blebbistatin, a recently discovered contraction inhibitor. Narine Sarvazyan and her colleagues at George Washington University have described methodological issues that should be taken into account in optical mapping studies using blebbistatin. For example, perfusion with blebbistatin could result in accumulation of precipitate in the vasculature, which could in turn lead to misinterpretation of the data. Shown here is an extreme case of blebbistatin precipitation in rat heart under white light (left) vs. ultraviolet illumination (right). Courtesy of Narine Sarvazyan. The contraction inhibitor is quickly becoming the “compound of choice” in reducing motion artifacts during optical mapping studies, but open questions remain with respect to its use. “The use of blebbistatin has been shown to not affect cardiac electrical activity, but this is somewhat controversial,” Herron said. 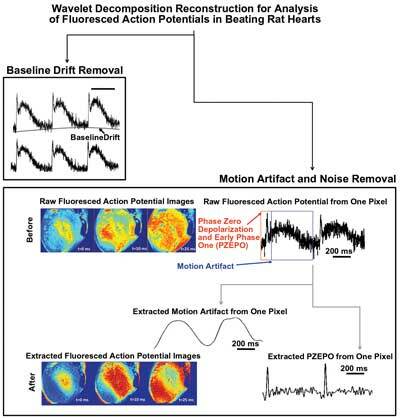 “Furthermore, inhibition of contraction may have impact on the conclusions that can be drawn from optical mapping,” because the heart is an organ in constant motion and its contractile activity likely produces metabolites and other modifications that contribute to overall cardiac function. Blebbistatin does not interfere with calcium cycling or voltage dynamics, but investigators need to keep in mind that cells expend energy on the act of contraction, Sarvazyan explained. So when contraction is inhibited or does not occur, the heart uses less energy. In studies of heart ischemia, for example, the rate of the rise in NADH – an index of ischemia – is about five times lower in the blebbistatin-treated heart than it would be otherwise. “People who study ischemia need to be aware that there’s a marked effect of blebbistatin on cardiac metabolism,” she said. Inhibiting contracting isn’t the only way to address motion artifacts in optical mapping of the heart. Sarvazyan points to a study by her collaborators Huda Asfour and Matthew Kay, recently published in IEEE Transactions on Biomedical Engineering. The study describes a novel wavelet-based algorithm that allows information extraction on both electromechanical activity and motion from fluorescence imaging of transmembrane voltage-sensitive dyes. Huda Asfour of the Kay group, together with colleagues at George Washington University, has recently described a novel postacquisition approach that allows one to extract information about both the motion and the action potentials from optical mapping of beating hearts loaded with voltage-sensitive dyes. The approach relies on different approximation coefficients from wavelet decomposition of optical signals. Courtesy of Huda Asfour/The Kay group. Efimov and colleagues are developing another approach: combining fluorescence imaging with voltage- or calcium-sensitive dyes with a technique called structured light imaging. A mature technology used for precision shape measurement in industrial production control, as well as for realistic human performance capture in a range of entertainment applications, structured light imaging offers a means to capture changes in three-dimensional shape with high spatial and temporal resolution. The Efimov group has done extensive work in the area of optical mapping. At left, an anterior view of a mouse heart [LA = left atrium, RA = right atrium, RV = right ventricle, LV = left ventricle, ECG = electrocardiogram]; (center) two representative optical signals using a calcium-sensitive dye (Rhod2-AM) and a voltage-sensitive dye (RH237), [Vm = transmembrane potential]; and an activation map of the time course of electrical propagation across the mouse heart. Each isocolor represents a different activation time for that particular region of tissue. Blue represents earliest activation, and red represents latest. Courtesy of Di Lang. Working with Song Zhang at Iowa State University, Efimov and colleagues have already achieved a rate of 667 frames per second and have reported applying the technique to capture the beating of a rabbit heart – using it to image and describe cardiac mechanics such as strain, curvature and displacement in three dimensions and, in turn, to digitally correct for motion in optical mapping studies on a pixel-by-pixel basis. The researchers hope to reach the goal of 1000 frames per second within the next year. The structured light imaging system they used achieved frame rates of up to 667 frames per second with X,Y resolution of 87 µm and Z resolution of 10 µm. Also, a robust, nonrigid surface-matching algorithm enabled tracking of dense surface motion across 3-D surfaces over time. Here, a schematic of a structured light imaging system used by the Efimov group and collaborators at other institutions to measure epicardial deformation in a beating rabbit heart. A digital light processing projector sequentially projects onto an object 10 binary fringe patterns, which are captured by a CMOS camera and used to produce 3-D images of the object with high spatial and temporal resolution. Of course, identifying and accounting for motion artifacts is not the only challenge in optical mapping studies. Such studies are complex, and investigators must be aware of a host of other factors – including, for example, the possible cytotoxicity of the fluorescent probes used in the studies. 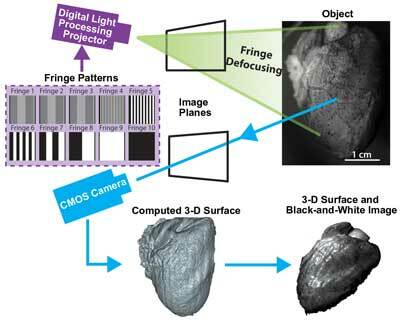 One of the most important recent developments in cardiac imaging is the advancement of multiparametric imaging, which is extending optical mapping beyond the measurement of action potential and calcium waves. An example is combining mitochondrial voltage sensors with calcium measurements to gain new insight into how mitochondrial electrophysiological function affects whole cells and cardiac tissue. Measurement of intracellular pH, nuclear calcium cycling and activity of reactive oxidative species could also be accessible using fluorescent probes for these parameters.